Via: Learning and Entertainment Evolution Forum - 2009LEEF 2009 will be held on June 18-19 at Harrisburg University, PA. 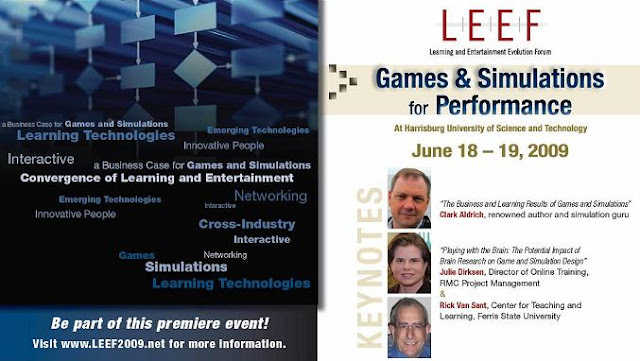 This is an interactive professional development event that will showcase the convergence of learning and entertainment technologies and explore the benefits of, and business case for, Games and Simulations for learning and performance. Keynotes address will be delivered on June 18th by renowned author and simulation guru Clark Aldrich on "The Business and Learning Results of Games and Simulations" and on June 19th by Rick Van Sant and Julie Dirksen on "Playing with the Brain -The Impact of Brain Research on Game and Simulation Design". Analysis and discussion of cutting-edge industry case studies, demonstrations of emerging, high-tech applications, and networking among diverse peers, this cross-industry event is designed to inspire innovation and introduce new knowledge and techniques. LEEF brings together learning leaders, entertainment developers, designers of leading-edge technologies, business decision makers, creative entrepreneurs and researchers who are focused on using emerging tools and solutions to improve performance and enhance learning. The program includes 2-hour case study sessions providing a high-level overview of the project, hands-on engagement , and group analysis of how to apply the project's best practices and lessons learned to other scenarios. Specifically they shall cover measures to identify evidence of changed behavior and outcomes, and the project's return on investment. Sign up for e-mail updates to receive more information as the program is finalized.